My parents-in-law visited for Memorial Day weekend. They’ve been coming up to Sacramento every Memorial Day weekend for ages because my father-in-law plays drums in the Sacramento Music Festival every year. The difference for this visit was instead of all of us staying in a hotel in Sacramento, we had them stay over at our house in Davis. They arrived on Friday night after we’d spent the day cleaning up the house (Things get really dirty when you’re still in the moving in process!). 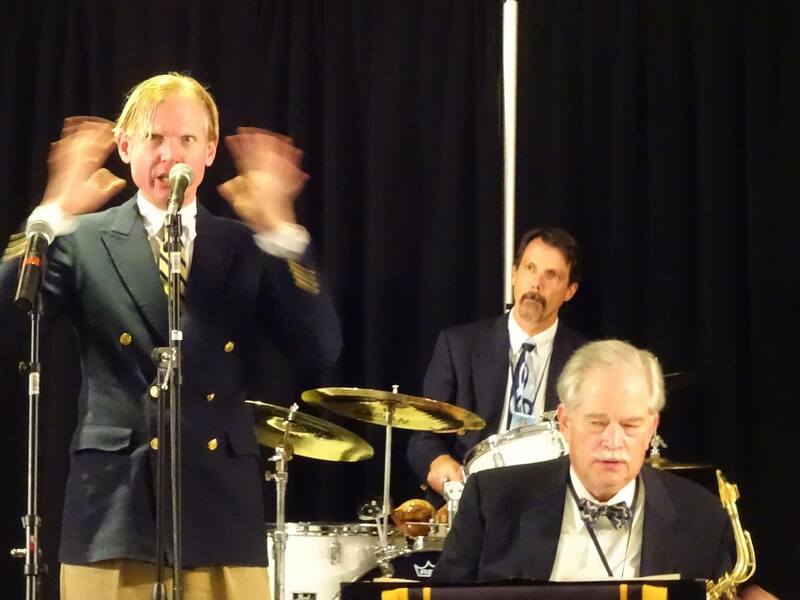 My father-in-law wasn’t playing in the Sacramento Festival until Sunday, but he did have a gig in Oakland on Saturday night. We spent Saturday hanging out and taking a tour of the activities in Davis. Our new house is right by the Davis Greenbelt, a walking path that goes throughout the whole city and connects most of the city’s parks. We went walking on that and showed the in-laws the neighborhood that we live in now. They got to visit with the cats and see Carma’s injury. After my father-in-law left for his job in Oakland we went to our old apartment which we are still paying our lease on and swam in the pool there. I didn’t swim because I thought it was still too cold, but my wife and mother-in-law did. Sunday morning I had an unfortunate surprise of having to do more schoolwork. I’d thought I was done, but it turned out that I needed to redo one of my lab reports. I spent the morning doing that and then we went to the Music Festival. Usually we go out for ice cream after the festival, but this time we went to our favorite ice cream place, Leatherby’s, before. Ice cream for lunch is great! The Festival was a lot of fun. The room my father-in-law’s band, The Royal Society Jazz Orchestra, played in was so full that even though we were related to one of the band members it was difficult to find a seat. After dancing and listening to some 20s and 30s style jazz we came back home and I continued to work on my lab report late into the night. The next morning I continued to work on my report with a break to chat and talk with the in-laws before they left. A great little visit from family. Lots of fun! We figured out we could probably use another little trashcan, a lamp, and some hangers for future guests. That’s the story from Memorial Day Weekend! It’s hard being an anti-magic city in a high magic setting. 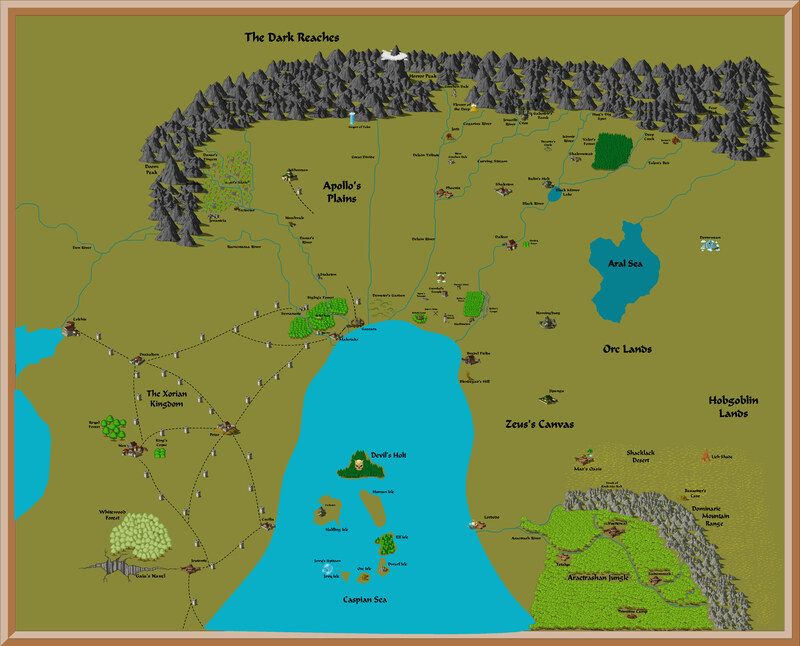 The little town of Balin’s Holt was originally a large city called Fangaroot. Fangaroot had high crop yields and was very prosperous due to the healthy silt of the Black Lake the city. A Green Dragon, Kenderax, desired all the wealth the people of Fangaroot had acquired. This Dragon organized all the Kobolds in the Kobold Lands to the north of Fangaroot. They attacked and in the process Fangaroot’s physical shell was destroyed. Kenderax was slain by the Dwarven paladin, Shalein, before the citizens of Fangaroot abandoned the city to the Kobolds and fled south to found Dalleer. In 616 BC, 430 years after Fangaroot fell, a descendant of Shalein, named Balin, decided to reclaim the city for his family’s honor. He led a band of like minded people against the Kobolds and managed to defeat them with Balin’s magical abilities and a Halfling scouting brigade led by Terry, the accomplished rogue, who disarmed the Kobolds’ strategically placed traps. Balin headed the council of the new city and named it after himself when the councilors rejected using Fangaroot as the name again. Balin ruled fairly for many years and he never had a serious opponent in the annual elections for head councilor. Balin developed a strong friendship with Terry; but, with Terry’s unfortunate death, Balin became a recluse. He no longer attends the council meetings and is the leader only in title. He is only seen for the hour of midnight in the Dragon’s Den pub on the south of town looking out over the lake. The pub is named Shaelin’s Glen after Balin’s ancestor. When he goes there many people ask him sage questions that only he knows the answer to. Balin is also he only person licensed to sell or buy magic items in the city, making midnight hour at the Dragon’s Den very popular for the right kind of person. With Balin gone the council has begun to increase taxes for scientific pursuits. Arcane magic is not very well thought of in Balin’s Holt. The people there see it as only destructive. They instead hope to use nature’s normal laws instead of manipulating them to create fire or lightning. Magic is not outlawed in the city, but it is pretty close to it. Magicians are constantly watched by the Forsakers, a group of secret police who forsake magic of all kinds and in doing so gain some immunity to it. Detection spell are punished as trespassing in people’s minds. Any crime committed with magic is punished doubly than if done without magic. In contrast, divine magic is generally accepted by the people in Balin’s Holt. It saved their ancestors from the dragon, Kenderax, and they have continued to trust completely in it. Detect spells are still not allowed by divine casters. It is believed that if evil is to be punished it must reveal itself in an obvious manner first. The temple in Balin’s Holt is large enough for two times the 6,000 people who live there and services are attended by almost everybody in the city on every holiday and full moon. 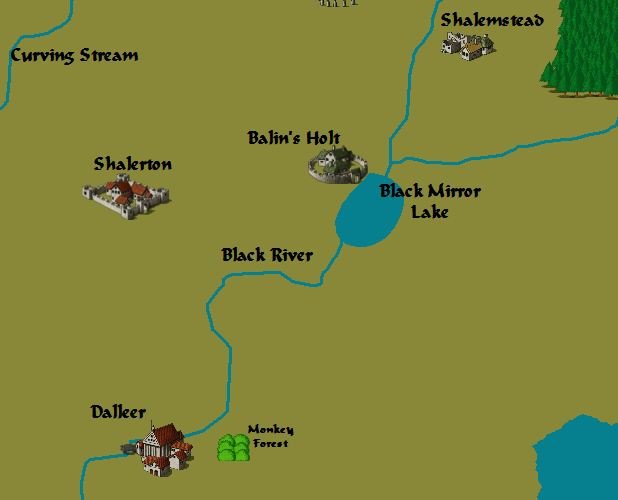 Balin’s Holt has a port on the Black Lake where trade is done with the other small towns to the north and with the large cities to the south. The lake is black because of the charcoal deposits created during the Titanomachy just upriver. This doesn’t taint the water, but instead acts as a filter for the water making it very clean. The people of Balin’s Holt are offended at the smell of most people in the rest of the world because they bath at least every three days. The charcoal also fertilizes the ground near the lake making Balin’s Holt’s crops larger and juicier than any other city’s. The specialties of the town are root vegetables and squash. A thieves guild was formed in Balin’s Holt by Terry. It was sanctioned by the town as long as they did not steal from anybody poor, were seen while stealing, or if any tax money was taken. Since Terry’s death and Balin’s eventual departure from the council the thieves guild has become more of a scientists guild. They are no longer allowed to steal things in any way at all. The thieves now research new technologies that will benefit the public. Many works of art are produced in Balin’s Holt. The city’s most famous piece is in the center plaza. It is a large painted marble miniature of the battle in which Kenderax was slain. The whole thing is fifty feet in diameter with each man in it being about a foot tall. Other masterpieces can be seen throughout the city and many people who wish to be artists for their trade come here to be indentured. For a while now I’ve been rolling the idea around in my head of posting stuff about Cimmeria, my current D&D campaign setting. I’ve avoided it previously because I want to post stuff about Gurutama and I didn’t want it to get too confusing with two D&D campaign settings in the same place. I’ve decided I don’t care so much anymore. I’d like to start posting stuff about my Cimmeria campaign. I’ve been posting campaign log entries on a thread of the Order of the Stick forums for a few years now. But there’s just this immense pile of background info that I’ve created over the years of playing in this setting. I’d like to make that available, but how do I do it? Through posts seems the most obvious way. I think I’ll start trying to post one thing a week about Cimmeria. I’ll mirror the blog posts with pages setup through the top bar on the webpage so the content will be easily accessible in the future. This serves another purpose as well. While all this information has been available for my players in the past, its been a little outdated. About 45 years have passed in my campaign setting since I originally created it, so many of the things I originally wrote are no longer accurate. This king is dead, that building burned down, that city got founded, etc. If I update that info it will give my players access to better information. Making it available through a website instead of a single word document might also be helpful. So… I think I’ll start this week off by going through the cities of Cimmeria in alphabetical order. First up, Balin’s Holt! We saw Pitch Perfect 2 and sadly it suffered from sequelitis. That’s when the sequel to a movie just isn’t as good as the original and probably wouldn’t have been made if it didn’t already have an established fanbase. It’s still a decent movie and if you enjoyed the first movie you’ll most likely enjoy the second, but I wouldn’t recommend it to anyone who hasn’t seen the first Pitch Perfect. So what was weaker in this movie than the first? Gosh… Where to start? The two announcer characters got a lot more racy and offensive. They were already a little bad in the first movie, but it was cringeworthy in the second. I listened to a few interviews of the production staff as well and apparently most of the announcer scenes were adlibbed. I don’t know if that makes the racy parts better or worse, but they’re there. The romantic plot between Beca and Jesse is essentially absent in the second movie. Their relationship is stable and off-camera. Their romantic sub-plot is replaced with Fat Amy and Benji’s two love interests. While those sub-plots are interesting they don’t really compare to the entertainment provided by Jesse cracking open Beca’s shell in the first movie. The other thing that’s absent is Beca’s dad. I really liked his role in the first movie. It makes some sense to phase out parental figures as the characters get older. And the whole sub-plot of Beca getting over her parents’ divorce is absent in Pitch Perfect 2 means that her dad doesn’t have much to do. I still missed his presence though. He’s somewhat replaced by the mother of a new freshman member of the Bellas, but the new relationship isn’t nearly as interesting as the old. The villains in the second movie, Das Sound Machine, aren’t nearly as likeable as the Treblemakers. Now why would you want to like your villains? Well I just wrote about that in a previous post. Go read that one and come back if you need an answer to this question. Das Sound Machine are portrayed as just evil which makes them a little boring. The movie also portrays them as hyper competent. While that’s definitely true, their performances are still a little boring. Their first performance is Uprising by Muse, one of my favorite songs. They do a great job, probably as good as they could do, but the song just sounds awful in acapella. I could barely understand the lyrics over the background music imitations. The musical performances do really suffer compared to the original movie. There are good reasons for this. The Bellas as a whole suffer some sort of identity crisis that comes out in their performances not being as good, but that also means that the first half of the movie has unsatisfying performances by the Bellas. The first movie had this as well, but it covered it with humor. Aubrey throwing up pulls you into the hilarity of the movie right away. Aubrey’s tongue lashing after the poor performance at the fraternity party is great character development for her. How does the Bellas excess use of props enhance the other plots in the movie? I felt the songs picked for numbers were in general worse than the original as well. I didn’t know as many this time around and that hampered my enjoyment. And there’s just a few other things that the second movie just missed. Lily’s little whispers aren’t as terrifying as the first movie. Beca’s odd sexual attraction to Das Sound Machine’s leader isn’t explored further by having Jesse find out. The inclusion of the new freshman in the Bellas felt like an excuse to have an original song in the moive so they could sell something with fewer royalties attached. If the international competition is for college groups, why are people out of college allowed to compete? Just tons of small stuff like that. Like I said, its not a good movie for people who haven’t seen the original. For those who enjoyed the original, there’s still plenty of stuff like it in the new movie. The songs are still catchy and Fat Amy is still hilarious. I took my cat, Carma, to the vet because she had a rather large lump on her cheek. My lumps. My lumps. 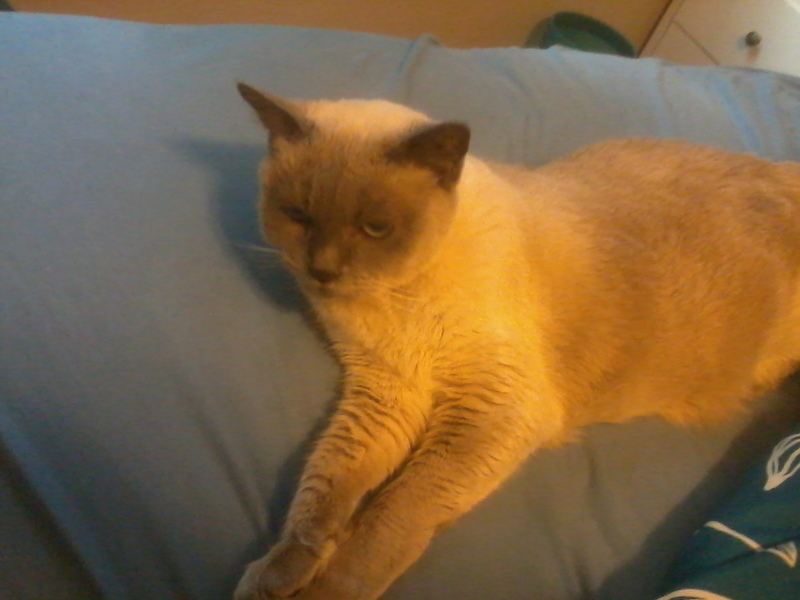 My lovely kitty lumps. My wife noticed the lump at the beginning of the week. I felt it on Sunday and it felt like it was only fur back then. The lump grew as the week went on and it became clear that we needed to get her some help. She wasn’t eating, drinking, or moving around as much as she usually does. We made a vet appointment and I looked up her symptoms online. While we were worried about cancer at first, her symptoms matched up with an abscessed tooth. She’s had tooth problems in the past so a tooth infection didn’t seem too far fetched. When I took her to the vet the diagnosis was not an abscessed tooth, but just an abscess. She had an infected wound on her cheek. Something had punctured her cheek and gone through into her mouth. There was nothing in the wound and the wound was about the size of a cat tooth so the veterinarian guessed that it was a bite from another cat. Carma never goes outside for long enough periods of time to meet other cats. The only possible culprit is our other cat, Lucky. They must’ve gotten into a fight and Carma got the worst of it. The treatment for an abscess is to puncture the sac of accumulated pus and let it drain. They did that by shaving the fur on Carma’s cheek and then poking the lump with a knife. Seems odd that you’d treat a puncture wound with another puncture, but there you go. 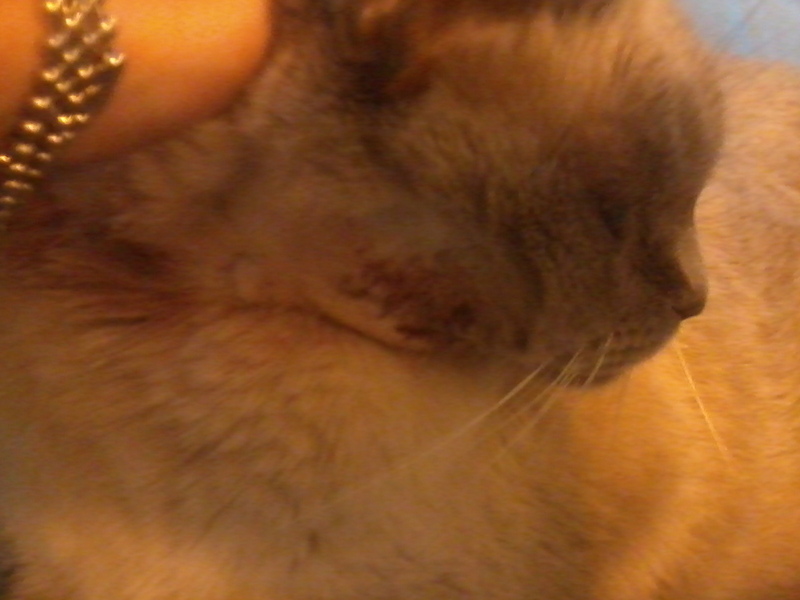 Carma came back from the vet with her right side covered in blood and pus. 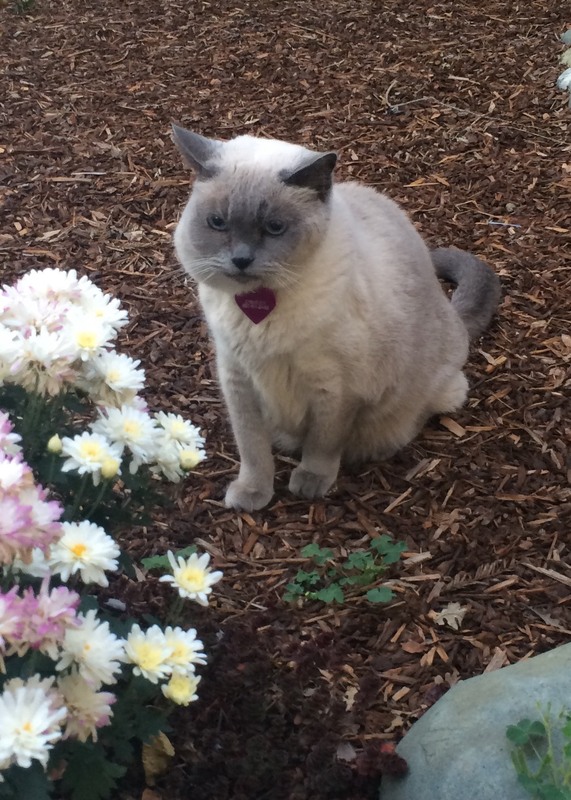 She was also quite grumpy. Best shot I could get of Carma covered in ooze. The vet told us that Carma would clean off the blood and pus herself, which she did. 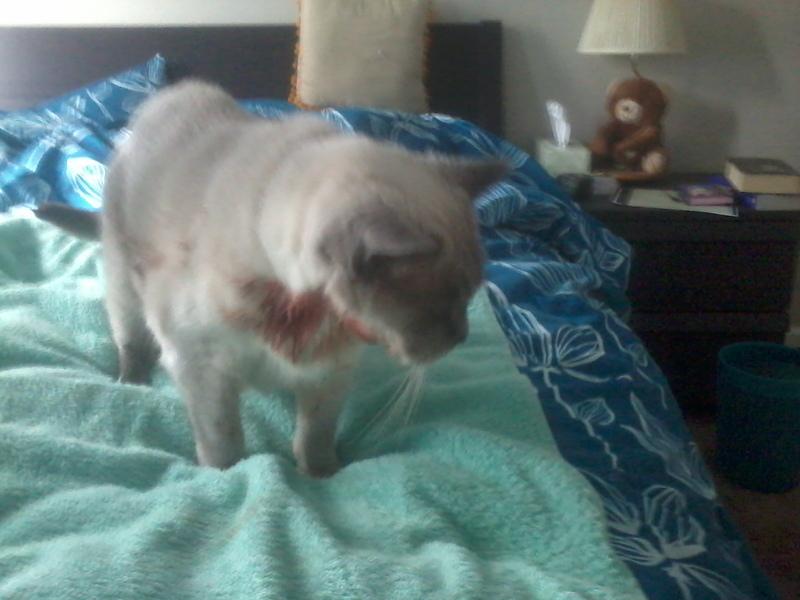 She also got blood and pus all over the blankets in our room despite giving her a towel to bleed on. She is a lot happier now. Moving around more, eating, drinking, coming downstairs, etc. Here’s the injury after she cleaned it up. We’re also trying to get Lucky to be less inclined to bite her. Any tips for that would be appreciated! Either way, Carma is on the road to recovery with twice a day antibiotics. Hopefully her summer coat will grow in and her shaved face will return to its former luster. All the majesty of note paper made for teachers. While cleaning out one of the moving boxes I found an old list of stuff my wife and I made. 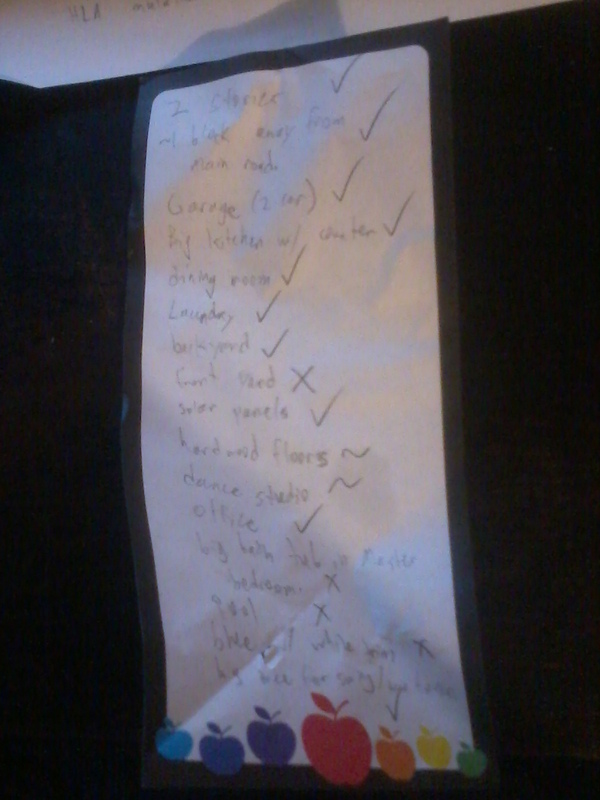 The list is of things we wanted in our house and the list was made before we started looking for our house. We got this one! Bedrooms and office on the second story. Everything else on the bottom floor. 2. A block or more away from a main road Check! The reason for this one was to let the cats go outside unsupervised without worrying about them being run over on a main road. 3. A two car garage Check! We won’t necessarily park both our cars in it (once we get another car), but its nice to have the option. 4. A big kitchen with a counter Check! Our old place had a tiny kitchen without an island counter. Getting a big place to make meals feels great! 5. A dining room Check! The old apartment had a tiny little section for the dining table that wasn’t really its own room. Our new house doesn’t have a dining room either, but it has two large places where the table can go (we’re using one of them). We’ve got a washing machine and a dryer! No more lugging clothes 300 feet to the laundry building in our complex or hoarding quarters like they’re more valuable than gold. Yep! Got a real nice backyard that’s good for playing in with kids or for having meals during the summer. 8. A front yard Sort of. We have landscaping in the front but I wouldn’t really call it a yard. Too many bushes and things. We could change it to have a yard though! The solar panels are sort of leased through a company. We don’t own the solar panels. A company does and they sell us the electricity they produce for about the same amount that PG&E charges. We then get reimbursed from PG&E for any excess electricity the panels produce. Odd way of doing it, but we are contributing to renewable energy with the panels! 10. Hardwood floors Sort of. I’m allergic to dust which crops up in carpeted floors. Hardwood doesn’t collect dust the same way. We’ve got carpet on the second floor, but the bottom floor is tiled. That’s good enough for me. 11. Dance studio Sort of. Not really present in the house. Instead we have a big mirror in the entrance hallway to the house that serves pretty much the same purpose. There’s plenty of space to dance there with a mirror to look at yourself even if it isn’t an official dance studio. Yep! Writing this post in the office right now. 13. A big bath tub attached to the master bathroom No. We didn’t get this one either, but that was a conscious choice. We looked at a house with a pool and it took up most of the backyard which we also wanted. Plus, the maintenance on a pool is pretty expensive. 15. Painted blue with white trim No. We like the colors, but it isn’t blue with white trim. We could still repaint the house in the future. 16. A big tree for a swing or a tree house Check! The treehouse is actually a playhouse, but its basically what I wanted. All good! 17. A better HVAC system than our apartment Check! Our old apartment had wall AC units and a heater that didn’t work (heater wasn’t that big an issue in Davis). One of the rooms never got AC. The new house has central heating and AC that both work great. We’ve also got a whole house fan which is a much more energy efficient method for cooling the house at night. Got a fireplace in the back living room. We haven’t used it yet but we probably will sometime next winter. 19. Big bedroom closets Check! The closets aren’t as big as the walk-in one at the old apartment, but they’re still big enough for us. 20. Close to where my wife works Sort of. The house is about a mile and a half from the school where my wife works, so not as close as we originally wanted. This ended up being a good thing as my wife wanted to avoid seeing her students outside of school. Just a little tough to always have to be “on” as a teacher at the grocery store. We live in a different neighborhood than the school so none of the kids are around here. 21. Space for a garden Check! There aren’t any planter boxes yet, but we’ll get some. And that’s it! We got most of the stuff that we wanted and it feels pretty good. People should post books they read on Instagram instead of food they eat. 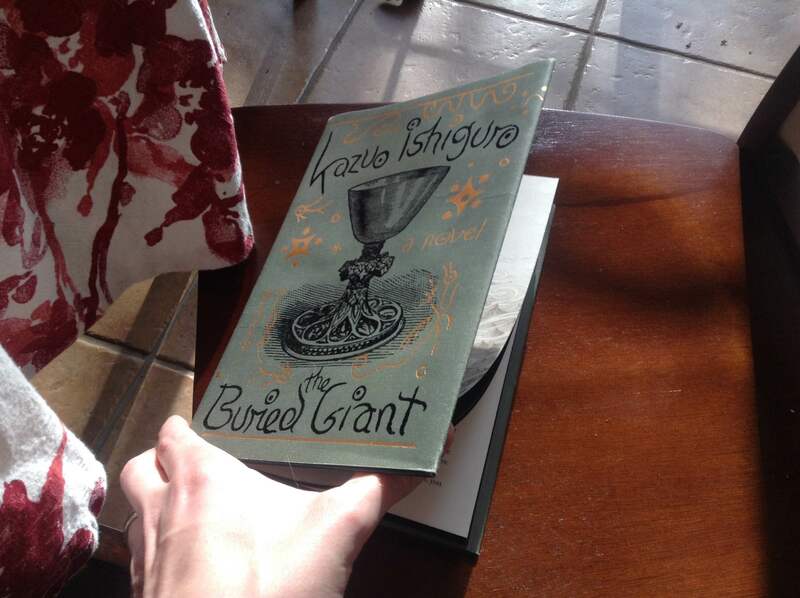 I finished reading a book called The Buried Giant by Kazuo Ishiguro that my step-mom had gotten me. I’m going to be delivering some spoilers about the book in this post, so be forewarned. If you’re interested in Kazuo Ishiguro’s writing or King Arthur stuff I’d recommend you finish the book on your own before reading this post. The book is set a generation or so after King Arthur, when all his knights are getting old or dead. The book follows the journey of a married couple, Axl and Beatrice, who are traveling to their son’s village. A mist covers England clouding people’s memories. People forget things after the simplest of distractions. Old memories are difficult or impossible to recall. And the problem affects everyone. The memory mist springs from a dragon and it becomes the quest of Axl, Beatrice, and a few people they meet on their journey to slay the dragon. The dragon slaying is all fine and good and I loved reading those parts. It may not be a traditional King Arthur tale, but I love reading new takes on old things and it hit a home run in being a King Arthur story. What bothered me about the book is what has bothered me about a lot of books, the ending is sad. That answer was good enough for me back then, but I’ve done some more thinking on it since. First, bad endings are not solely the province of modern stories. Oedipus Rex is a perfect example of an ancient story with a horrible ending. Romeo and Juliet is based off the Greek myth of Pyramus and Thisbe. The Iliad has a powerful ending, but no one really gets what they want. Hector is still dead and Achilles still feels empty. The second thing I realized is that it isn’t so much the sadness that makes stories feel real. You can’t just have something bad happen to someone and expect people to start feeling empathy for that character. No. What makes stories real is having characters on both sides of a conflict who could both be described as good. They’re both heroes in the story, but they have antithetical goals. One must die for the story to reach resolution. And that’s what makes it sad. The conflict doesn’t always need to end in death and the characters don’t always need to be diametrically opposed, but ultimately the “villain” of an adult story must have real motivations for what they are doing. And most real motivations are fundamentally good. People do things to help themselves or the people they care about, not because they want to hurt other people (sadists are exempt). An easier separation between what I’ve called good and bad endings in the past would be children’s stories and adult stories. Stories need to be simplified for children which can mean having a villain who is just villainous for no good reason (Jafar, The Star Wars Emperor, Mordred from King Arthur, etc.). But back to The Buried Giant! Early on in the book Axl and Beatrice encounter a woman who tells them about a mysterious island that is clearly some sort of allegory for Heaven. It’s said that you can live on the island and never see the other people living there. Only a couple that is truly in love will be able to interact with each other on the island. A couple’s truly in love status is tested by the boatman who brings people to the island. He asks couples a series of individual questions before permitting them to travel together. The woman that Axl and Beatrice meet describes that happening to her and her husband. They answered the questions and then the boatman said the water was too rough to bring them to the island at the same time. Thinking she would get to see her husband on the next boat, she said, “Fine,” and her husband went first. When the boatman came back he informed the wife that she had failed the questions and that she would not be seeing her husband on the island. She left in a rage and wandered England before eventually telling her story to Axl and Beatrice. Our protagonist couple talk about the island constantly. They are concerned that they won’t be able to answer questions about their love for each other if the dragon’s memory mist prevents them from remembering why they originally fell in love. In the final chapter of the book they talk to the boatman. The boatman talks to Beatrice first and then to Axl. We only hear Axl’s conversation. The boatman is very casual and brings up a fight that Axl had with Beatrice once. Axl explains the fight, but is suspicious that he and Beatrice will be denied joint entrance to “Island Heaven” if he tells the whle truth (the reader never learns the whole truth). The boatman agrees to take them both to the island. Axl hops in the boat with Beatrice. Axl’s face darkens. He knows he failed the questions, but he doesn’t want to say goodbye to his wife. He stays in the boat. Beatrice tells Axl she’ll be fine. They can just meet when the boatman brings the next boat. Not wanting to upset his wife, Axl gets out of the boat and trudges towards shore. And the book freaking ends there. I understand that sad endings are sometimes more realistic, but this felt more like the author screwing with me. Couldn’t they have been allowed to go together? Couldn’t we have learned a few more specifics about what Axl and Beatrice fought about long ago? Nope! Ishiguro does the smart thing. If you have questions that don’t need answering in a story, then don’t answer them. People will come up with their own answers and those will always satisfy the readers more than anything you can come up with. And that’s a sad ending.